Burt's Bees has come a long way from its humble craft fair beginnings, but it still stays true to its original philosophy of being an "Earth Friendly, Natural Personal Care Company." Burt's Bees create natural, Earth-friendly personal care products formulated to help you maximize your well-being and that of the world around you. Burt's Bees products are carefully crafted using ingredients that are the best nature has to offer: beeswax, botanical and essential oils, herbs, flowers and minerals. These safe, effective ingredients have withstood the test of time. There are ingredients that you will never find in any Burt's Bees product, such as sodium lauryl sulfate, which is a harsh, aggressive ingredient used in most cleansing products like shampoo, rather than loading their products up with harsh chemicals or unnecessary fillers, they only offer you only the good stuff. There's something for everyone, from babies and mothers to teenagers, with pretty much every skin type in between, whether you have blemishes or skin that needs a boost. So discover Burt's Bees today and see for yourself just how much we have to thank Burt's bees for. Your skin will be glad you did. 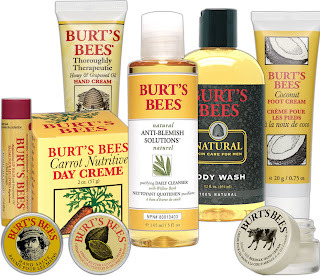 You'll find a great range of Burt's Bees products for sale at 24ace.co.uk. What a great gift to give this Christmas.